I love trying out new beauty products, so there is a constant rotation through my bathroom of new hair, makeup, and skin care products. While I try many things that I like decently well, the true test of a great product is if it stays in my regimen for more than a couple of weeks. These 5 products are ones that I am using every. single. day. and have been for several months now. Softsoap Basil & Lime Hand soap // This has got to be the best hand soap I've ever used that you can purchase at a big box store. I have a really sensitive nose, so I am very particular about what kind of hand soap I use, since I can smell it long after I've finished washing my hands. My mother-in-law had this soap at her house over the summer, and I immediately knew I needed it. I've stocked up on it in case they ever decide to stop making it. Bath & Body Works Aromatherapy Body Cream in Eucalyptus Tea // My aunt brought me a sweet gift bag of several items right after Madeleine was born, and this body cream was one of them. I've been using it on my hands every night when I get into bed since Madeleine was about a week old. It really is very calming, and I love that this scent will forever remind me of those early days when Madeleine was so tiny and new. Olay Regenerist Luminous Tone Perfecting Cream // It's so hard for me to find a moisturizer that I love. I lean towards having dry skin, so I want it to soak in and moisturize without leaving my skin greasy. This cream is not heavy at all, but it leaves my face feeling so smooth. Bonus: it smells SO good (notice a trend here??). Dove Advanced Care Nutrium Moisture Deodorant in Caring Coconut // I don't know if it's just me, but since becoming a mom I sweat like nobody's business. Between carrying a heavy carseat with a growing baby in it, to having said baby right up against me eating every few hours, I am constantly hot. I've used Dove deodorant for as long as I can remember, but this newer line of the nutrium moisture is my favorite. It goes on really smooth and--you guessed it--smells good. It smells better than that powdery scent of most deodorants, but the scent isn't so strong that it's trying to act like your perfume. John Freida Beach Blonde Smooth Seas Detangling Conditioner // I really like John Freida products for my hair, and I think this might be my favorite one yet. My hair gets really tangly and just a small amount of this conditioner detangles really well. It's also lightweight, which I need since my hair is pretty fine. It has a minty scent to it which is really refreshing and energizing. 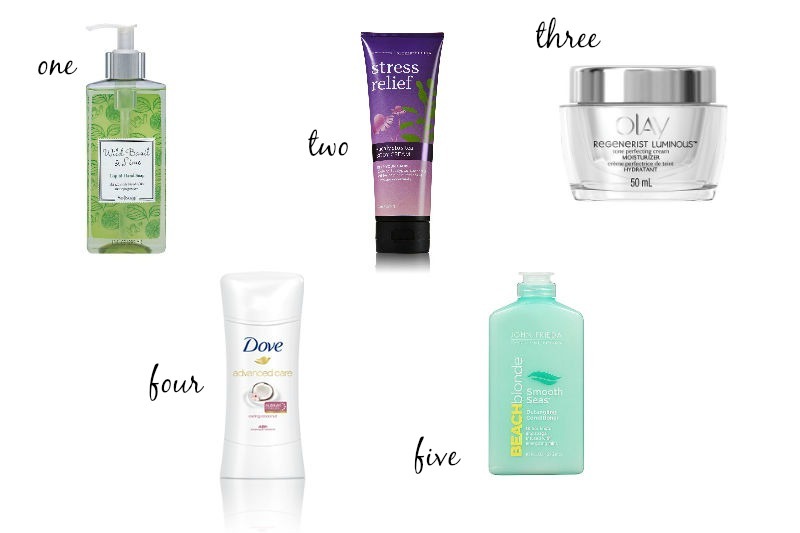 Do you already use any of these products? What are some products that you are using every day?